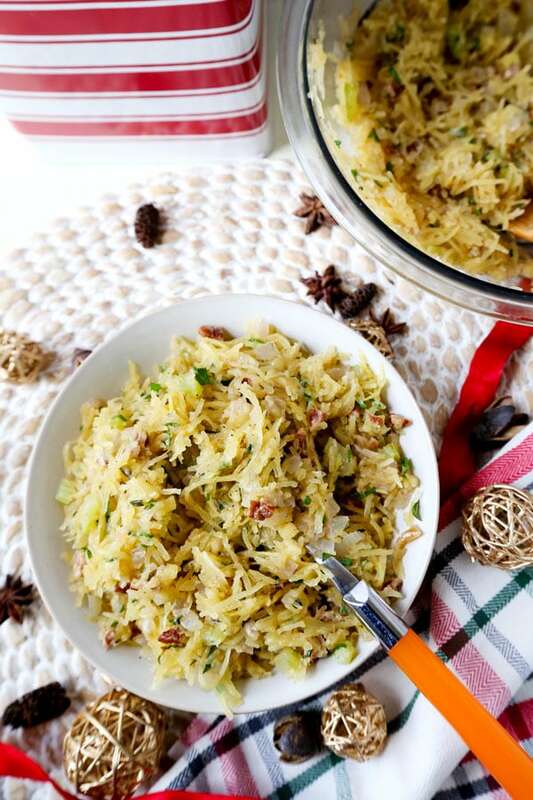 This gluten-free stuffing flavored spaghetti squash is a great way to cut down on carbs during the holiday season while still enjoying the savory flavors of a traditional stuffing! Ready in 30 minute from start to finish! 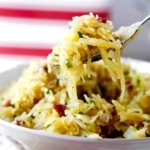 Spaghetti squash is one of those ingredients I love to cook with. It’s easy to prepare and can take on so many different flavors! 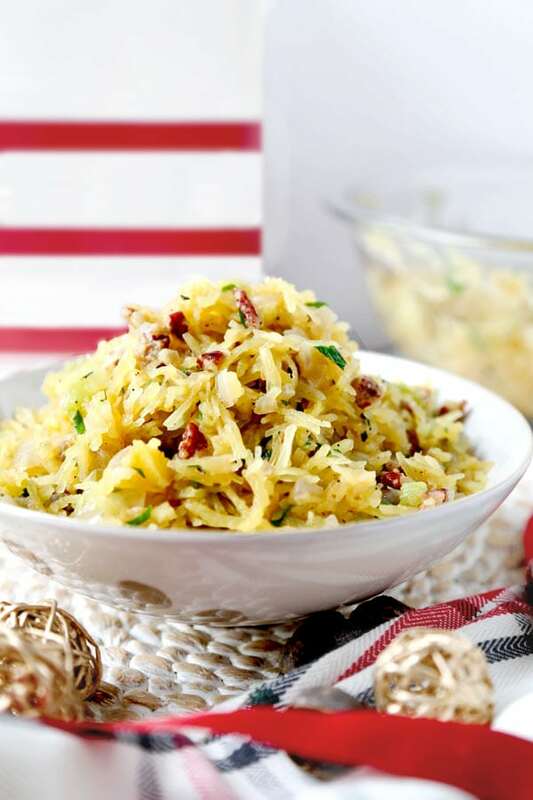 What I also love about it spaghetti squash is that it can be used instead of noodles or even rice to create meals that are lighter on carbs and calories. So when I found out last year that three of our Thanksgiving dinner guests couldn’t eat gluten, I whipped up a spaghetti squash dish that would contain all the flavors of a traditional stuffing. The flavors were so delicious that I’ve decided to skip the bread based stuffing altogether this holiday season. Let me show you how easy this gluten-free stuffing flavored stuffing is to make! 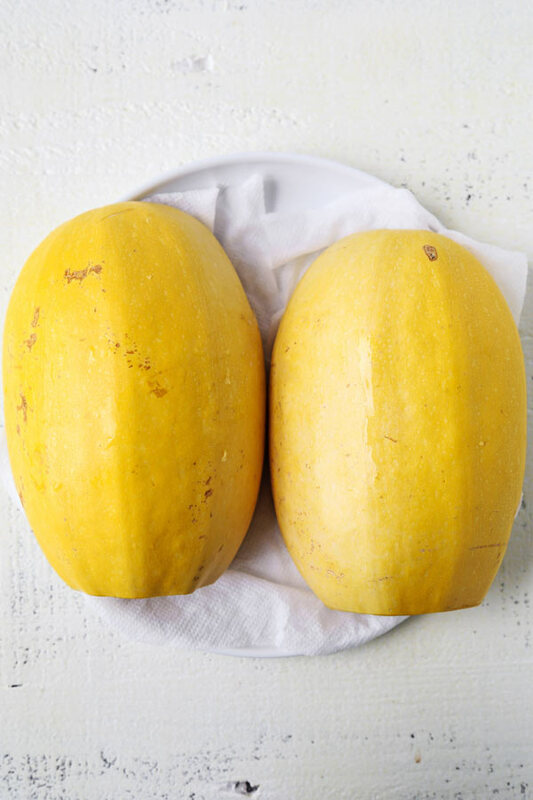 Spaghetti squash can be cooked in the oven or in the microwave. Both methods yield the same result but one takes a lot less time. For the microwave method, start by placing a damp paper towel over a plate or a microwave safe container. Cut the spaghetti squash in half lengthwise, scoop out the seeds with a spoon and place each half, cut side down, on the plate. Then microwave on high for 10 minutes and check on the consistency of the strings by scraping the inside with a fork. What is the right consistency for spaghetti squash strings? That’s totally up to you but I prefer them on the crunchy side. 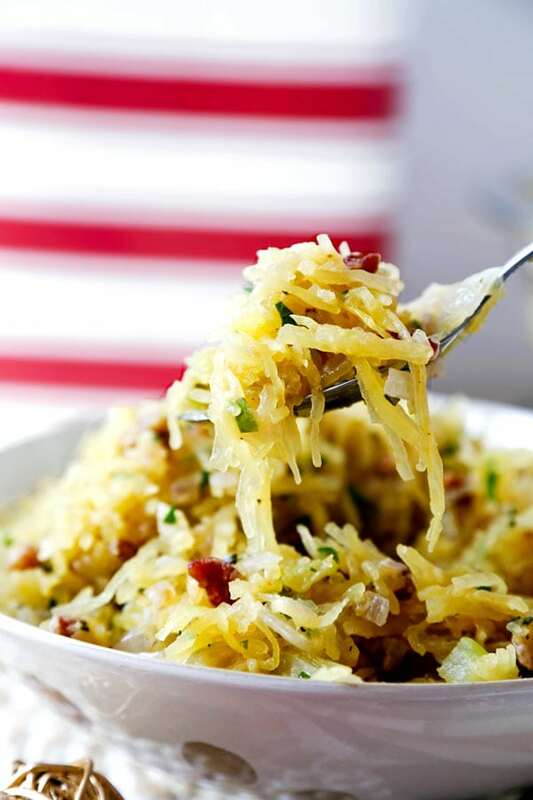 The reason being that spaghetti squash can get pretty watery if it’s overcooked. 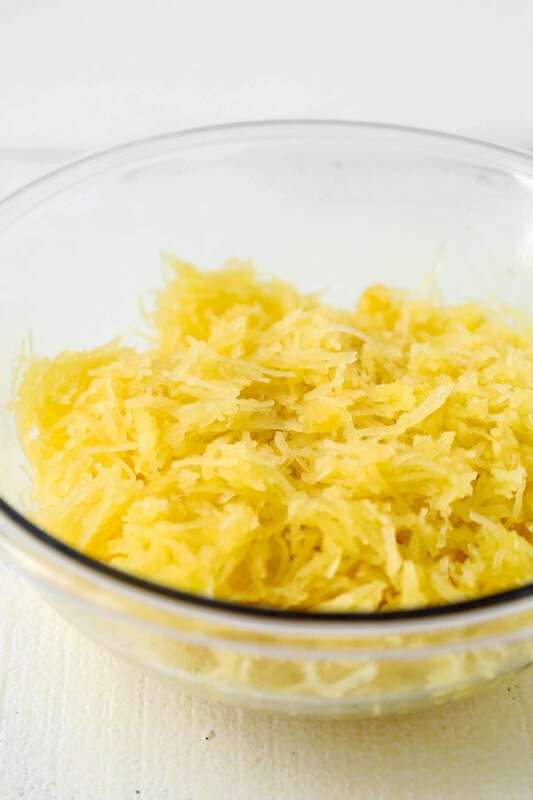 If you are eating spaghetti squash on its own, right out of the microwave without adding additional ingredients, then go ahead and zap the strings until they are very tender. If you need to saute the strings in a pan after they were microwaved, it’s best to undercook them in order to avoid a mushy, watery mess. For this recipe, the ideal consistency is soft enough that they can easily be shredded with a fork but not so soft that they release a lot of water. There are two steps to go before you can enjoy this festive dish – sauteing and tossing all the ingredients into a bowl. 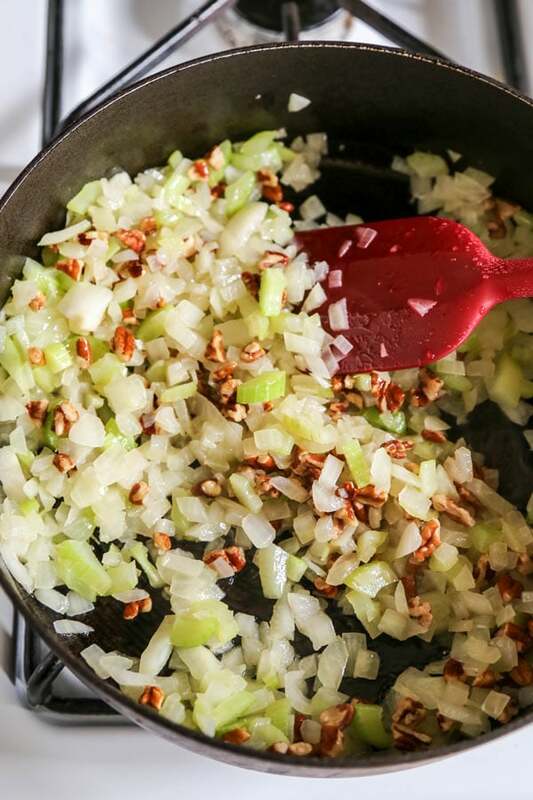 Throw the vegan butter, onions and celery in a pan and saute for a few minutes, until the vegetables are tender. Then add your nuts – I’m using pecans though walnuts are just as good – and saute for an additional 3 minutes. Turn the heat off and transfer the mixture to a large mixing bowl, along with the shredded spaghetti squash. Now here comes the good part – mixing all the beautiful flavors of Thanksgiving and Christmas into one jolly, merry bowl! Add the vegetable broth, fresh sage, parsley and rosemary and give the ingredients a good toss. Then sprinkle freshly grated parmesan cheese and toss again. Finish by seasoning with salt and pepper and there you go – a low carb holiday side dish everyone can enjoy! Skip the parmesan cheese and you’re good to go! Or, if you do enjoy the flavor of cheese, sprinkle 1-2 teaspoons (or more) of nutritional yeast to give your dish more depth of flavor and a kick of umami. Whether you prefer traditional holiday dishes or something with a twist, this gluten-free stuffing flavored spaghetti squash is a great option to add to your dinner menu. Especially if you have guests with dietary restrictions. We had no leftovers and many of my friends asked for the recipe, which they will be making this year in their own kitchen. How do you celebrate the holiday season? Do you enjoy serving up new, healthier dishes to your guests or prefer to stick to a traditional meal? I’d love to know what you are planning to serve at your dinner table this year! 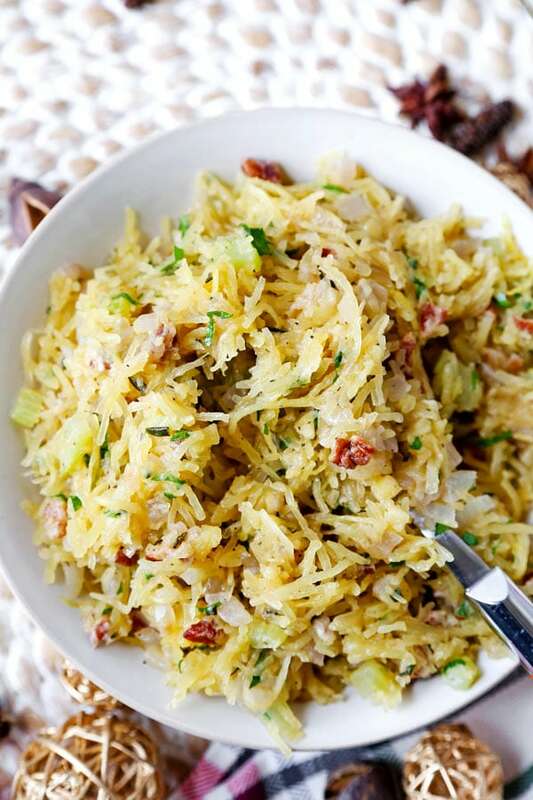 Did you like this Gluten-Free Stuffing Flavored Spaghetti Squash Recipe? Are there changes you made that you would like to share? Share your tips and recommendations in the comments section below! Cut the squash in half lengthwise and scrape the seeds with a spoon. Discard the seeds. Put a damp cloth or paper towel on a microwave safe plate or other microwave safe container and place the spaghetti squash, cut side down (skin facing up) on top. Microwave on high for 10 minutes. Take the spaghetti squash out of the microwave and shred with a fork into a large bowl. If the squash is still hard, microwave for an additional 2-3 minutes, or until it’s soft enough to shred. Set aside. In a pan over medium heat, add vegan butter, onions and celery and saute for 4-5 minutes, until vegetables are tender. Add walnuts and saute for 3 minutes. Turn the heat off and pour the mixture over the spaghetti squash. Add vegetable broth, sage, parsley, rosemary, and parmesan cheese, and toss well. Season with salt and pepper, toss and serve. This gluten-free spaghetti squash recipe will keep refrigerated for up to 3 days.